I’m really pleased with the plants supports; they are just the right height for our roses. The stakes should be ideal for my taller Dahlias. Packaging was spot on and no damage occurred. Just to let you know that the hoop was delivered earlier this morning - beautifully packed and protected - another first class job, and just what I wanted. Thank you for the very prompt manufacture and delivery of the plant support. It is now installed in the garden with a Clematis growing up it and looks fab! This is to confirm that I received the rose supports as promised last Thursday. I am so pleased with them, they have made such a difference to my wet and floppy garden and I have more planting space now that the roses are contained! Thank you so much for dealing with my order so promptly and for such a garden worthy product. Dear Gary - Just wanted to let you know how thrilled we are with the plants supports - they arrived promptly, well packaged and once unwrapped made an immediate impact in the garden even without any plants. The birds are quite familiar with them now and use them to rest on. Our garden is very windy so I am pleased they are so strong. Thanks again for being so efficient. I just wanted to let you know that the gardener I gave these plant supports to absolutely adores them - thanks very much for selling such lovely, well designed items. Dear Gary, the supports all arrived safely and are now happily sitting in the garden. Thank you. They are beautifully made. The rose support arrived yesterday as you said it would. It is beautiful. Thank you so much. I just wanted to thank you for my Marlborough plant support. I’m really pleased with it and it is now supporting a David Austin rose and a clematis and is enhancing what was a quiet part of my garden! Just a quick line to say thank you so much for the Marlborough supports. The quality is fantastic and the roses are recovering from the shock and look much better in their new home. Thank you for the dome, which we are delighted with. We shall follow the rusting instructions to the letter! Also, many thanks for getting it to us so promptly. Thank you so much for the prompt and efficient service in delivering the cottage support. It is exactly what I wanted and looks wonderful in my smallish garden with a clematis growing up it. I would heartily recommend your products and service. Received delivery of the stakes today. Fab! Thank you for a great product and prompt friendly service. With best wishes, Jo B. Rose support received today in good order. I am really pleased with it and looking forward to placing it in our "meadow" and choosing a suitable rose for it. Thank you. Regards, Valerie G.
Just to let you know the plant supports have been delivered. They are just what I’ve been looking for my peonies. Thank you! I am delighted to say that the supports have arrived in good shape. We have unpacked them and they look wonderful. Many thanks for your excellent service. Very best wishes, John H.
Just to let you know the plant supports have arrived and look great! They are sturdy but not too heavy to lift amongst the other plants in the border. All the very best, James R.
Dear Gary, Thank you so much for the prompt and efficient service in delivering the cottage support. It is exactly what I wanted and looks wonderful in my smallish garden with a clematis growing up it. I would heartily recommend your products and service. I just wanted to write to thank you so much for the fountain you recently made for us. My mum absolutely loves it and is looking forward to seeing it working in due course. Also, thank you again for making so much effort to getting it ready for her birthday, when you were clearly under a lot of pressure with other commissions. It was a pleasure communicating with you throughout the purchase process. The fountain is in and running! Please find attached some photos as promised. All the people who’ve seen it so far have been very impressed and we love it! 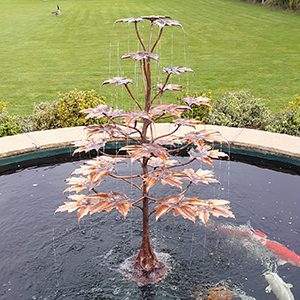 The fountain is now sitting in the pond and looks amazing – perfect. The fountain arrived safe and sound and looks fantastic! The water sculpture was very well packed and has arrived in perfect condition. Weather permitting I shall be installing it this weekend. Thanks very much for your fabulous artwork. Apologies for extreme delay in sending this picture, I am absolutely delighted with your water feature (Morning Glory). 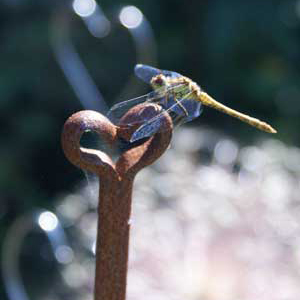 Just thought you might like to see your bulrushes [fountain] in action in our new garden. We're really pleased with it, and the sound of the water is very restful. Hope you like the photo. I am absolutely delighted with your water feature (Morning Glory). Thank you so much for getting our (copper) rose done, my wife is over the moon with it. It looks stunning and is just as I had hoped for. Your friendly help and exceptionally fast service was fantastic…it’s a shame more companies are not as professional as yours. Sculpture arrived safe and sound this morning.I thought that you would be pleased to know that Peter installed it this afternoon and it is working beautifully and looking really lovely. November 2011 - I can say, without fear of contradiction, that so far everyone that has seen it has been seriously impressed with your work on this, me more than most I must add, and once again I would like to thank you for all your efforts in the creation of this piece of art. Going forwards, if required I would be only too pleased to provide any form of reference that anyone may request and will forward some photographs of the leaf in position to you in the imminent future. The plaque [Birch leaf] has arrived and it is GREAT!!! It is even better than I thought it would be - I'm thrilled to bits. Thank you for your help. I love your plaque [large Hornbeam] a lot of people are asking me where it’s from. Its unique. Our beautiful Memory Tree which was made by Metallic Garden had proved to be a very popular addition to our hospice. It has pride of place in our reception area and we have received so many positive comments from visitors, families and our volunteers. 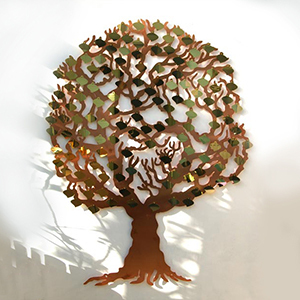 The design and quality of the tree is exceptional and the customer service from Metallic Garden is exceptional. Thank You for all your advice and continued support. Sue Watsham, Fundraising Manager, Butterfly Hospice, Lincolnshire. Just to let you know that the plaques have arrived safely. They look great and we are going to Low Barns Nature Reserve next week to sort out putting them up. Thank you once again for the speedy and excellent service you have provided. Here is a picture of the beautiful Love Tree. It's situated with the Chapel at the hospital that Teardrop supports. We will send more when we have the grand opening. Working with Gary and Bronwen at Finch Tree has been a real pleasure. They took the time to send us samples, worked with us on the designing of our Memory Leaves and gave us feedback on what would work best. This has resulted in us all being really pleased with the product and I am sure the people that purchase one in memory of a loved one will be happy with the product.